A mum's guide to the first day of school. A mum care guide to the first day of school. As four and five year olds around Australia get ready to take their places in classrooms for the first time, there is bound to be a lot of tears- and not just from the kids. Did you know that mums are more than five times more likely to cry at kindergarten drop off than their children? Yep, I’d believe that. In a survey conducted by U.K. firm Fairy Non Bio, 89 per cent of parents said seeing their child in a school uniform made them realise how grown up they were. So much so that 44 per cent of mums said they considered having another baby after their first born started school. There’s no denying it, the first day of big school can be highly emotional. So if your baby is about to embark on their schooling journey this year, here are some mum care tips to help you get through the first few days. Prepare yourself, as well as your child. Talk about what’s going to happen when you take your child to school. Tell them about how the day will work and prepare them for being without you. Start encouraging them to be independent in getting ready in the morning and making sure they can take themselves to the bathroom during the day. Prepare yourself for the day by acknowledging that they are growing up and celebrating their increasing independence. Assist them when needed throughout the day but encourage them to do things without you. Knowing that your child is able to manage some skills by themselves may make you feel better about being away from them. Of course you’re going to be emotional, it’s a huge milestone. Try and save the waterworks for the car after drop off though. Children take their emotional cues from the adults around them. You want your child to be happy and positive about going off to school; not conflicted about why you’re upset. Children are too young to understand the complexities of why you might shed a few tears on the day and will simply be upset because you&apos;re upset. So mum, pull out your best Oscar winning performance and smother them in smiles. Then dissolve into a puddle of tears once safely back in the driver’s seat. Totally acceptable. If you’ve got a bit of leave owing at work, consider taking the day (or a couple of days) off. That way you won’t be rushed saying goodbye, and you can spend the day being gentle with yourself- rather than adding work and commute stress to to equation. It can be really hard to know just what to do with yourself once you’ve done the school farewell so it might be beneficial to have the day planned out. It could simply be running errands and doing a grocery shop but it might also be nice to dedicate the day to doing something nice for yourself. Getting your child ready for school is a huge milestone for a parent and you’ve done an incredible job. Organise to have lunch with a friend, go to a cafe and read a book, see a movie or schedule a pedicure. You’re not Robinson Crusoe- heaps of mothers have been in exactly the same position as you are in right now. They know how you’re feeling. It can be helpful to have a sympathetic shoulder to cry on so find a friend who’s children are also at school (or someone starting school like you) and support each other through the first few days. If you don’t feel like being out and about during the initial few days of school, spend some time in the peace and quiet at home doing something that you’ve been putting off. Put on some of your own music (no wiggles allowed) make yourself a nice cup of tea and do something you enjoy. It could be adult colouring in books, painting furniture, gardening or cooking. Whatever you&apos;ve been putting off doing. Take the time to enjoy activities that you’re usually too busy or too tired to do. So maybe you’re not feeling sad about your child going off to school? Perhaps you skipped out that gate and didn’t look back. Guess what? That’s ok too. Whatever you feel on the big day is totally normal. There’s no need to feel guilty, or apologetic. And if you are the sopping mess being consoled by the teacher in the hallway, don’t give it a second thought. She’s seen it all before. However you get through the day, be kind to yourself and know that 3pm pick up will come around before you know it and they&apos;ll be back in your arms. 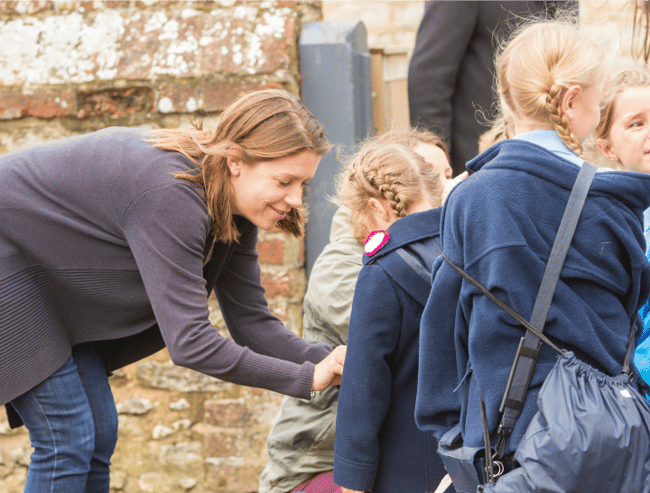 What are your tips for mum&apos;s sending their kids to school for the first time?